An Alsatian Quiche is a rich egg pie with bacon and hails from the mountainous region of Lorraine in northern France and is better known as a Quiche Lorraine. Quiche Lorraine has been adapted over the years from a humble custard and bacon pie to the substantial cheese, bacon, and egg creation that it is known for today. The quiche is more than enough for a filling meal in itself especially with a side salad, and simple enough for a quick lunch, snack or even for parties and picnics. Follow the recipe for making pastry dough. Roll out the pastry large enough to line a deep-dish pie pan. Lightly grease the pan and line with the pastry. Trim away any excess pastry. Place the lined dish into the refrigerator to rest, resting the pastry will ensure there is no shrinkage once cooked, Try to rest for up to 30 minutes, or longer if you can. Once rested, sprinkle the bacon onto the bottom layer of the pastry. Beat together the eggs, the half and half, salt, pepper, and nutmeg. Place the pie dish into the centre of the heated oven, then pour the eggs over the bacon and sprinkle with the shredded cheese. Bake the quiche for 45-50 minutes, until the eggs are set in the middle. Try to avoid overcooking (until the eggs are solid) as the quiche continues to cook once out of the oven, slightly undercooked means it will have a lovely soft texture once cooled. Cool slightly if you wish to eat the quiche warm (avoid eating it hot as it will crumble) or leave to go cold. Never serve the quiche straight from the refrigerator as it will be too cold, the flavors deadened and the texture hard. Serve with a fresh green salad on the side. 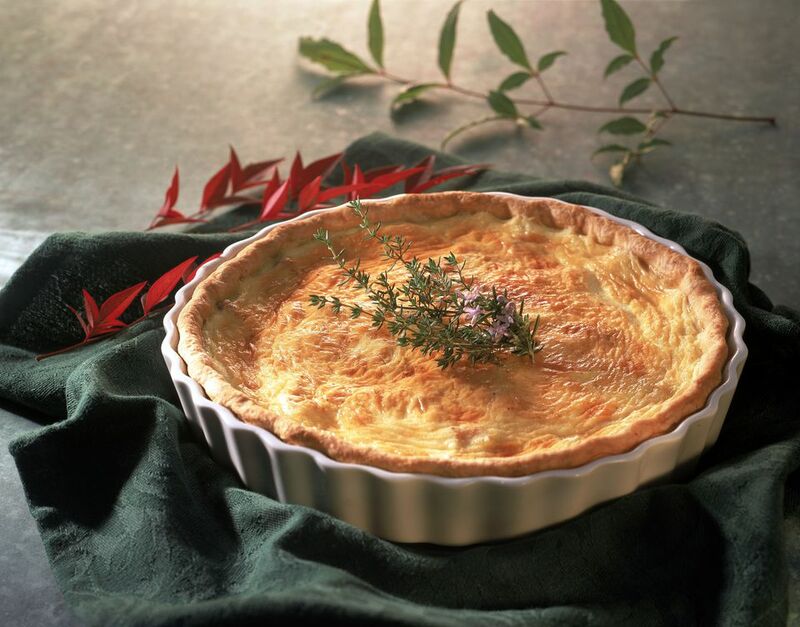 The term quiche has taken on new meanings as it gained in popularity around the world and many describe any egg-based flan no matter what the filling as a quiche. Quiche Lorraine is the original and in many ways, the best when cooked to an authentic recipe. This recipe features bacon, making it an authentic recipe, you can if you wish to remove the bacon for a vegetarian version.